Nick's interest in Irish politics and his career with McDermott's Two Hours led to a meeting in 1988 with Captain Fred Holroyd, an ex military intelligence officer in Ulster. 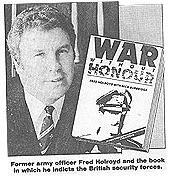 They collaborated on War Without Honour (Medium) launched at the House of Commons in 1989. Nick initially secured a commission from Harrap as a sequel to Stalker, but it was abandoned under Government pressure, and subsequently taken up by a small left wing publisher. Holroyd's allegations about the methods of British counter terrorism and his close connection with another whistle-blower, Colin Wallace, formed the substance of Ken Livingstone's maiden speech as an MP. The controversy that the book caused was well-documented in the national press and persistently explored in forums as diverse as the subversive magazine The Lobster and Richard Ingrams' column in The Observer. On a personal level, Nick was subjected to heavy-handed tactics, including a phone - tap and an intimidating visit by Brighton CID.